Picture by Sue Holland with http://www.mouseplanet.com/. My husband and I took our oldest son to DisneyWorld for his 5th birthday and Halloween almost one year ago. We dressed up as Darth Vader, Princess Leia and a Storm Trooper, too. We left our youngest son, an Ewok, with my parents. Our Storm Trooper is now almost 6 and just started Kindergarten, which is making me reflect back on that sweet time in Florida with our little guy. We obviously had so much fun on all of the special rides, including the Mad Hatter’s Tea Party which we rode over and over and over and over and over and over and over and over and over and over and over and over again. Seriously, the whole trip was “magical” (Walt’s favorite word) and made up of sweet memories, no doubt, including that lovely ride. Mixed in with my fun memories of absolutely humiliating my family by yelling at the top of my lungs things like, “Eat that wretched man! !” to the alligator holding Captain Hook in his jaws or “Am I really flying?? Weeeeeeee!!!HAHAHAHAHAHAHAHAHAHAHAHA!!!! !” in the most obnoxious tone ever on the Dumbo Ride are memories of seeing ridiculous shoes being worn by other Mickey lovers throughout the park. My wondering over the fact the Goofy could talk but Pluto couldn’t or why Mickey had to put on red shorts every dadgum day was temporarily suspended every time a pair of ridiculous shoes passed by me. Obviously, people can wear whatever they want. I just know that there is A LOT of walking involved in getting from the Buzz Lightyear ride to strolling through Mickey Mouse’s house (I loved his grocery list consisting of nothing but cheese!) to trekking back over to “Carousel of Progress”. That trek back to that last “ride” was even more strenuous as I had to convince my husband and son that it was a worthy way to spend a few minutes. It appears that only me and a handful of others felt that way, but oh to the well. I LOVED it! A scene from the 1890’s in Act 1 of “The Carousel of Progress”. 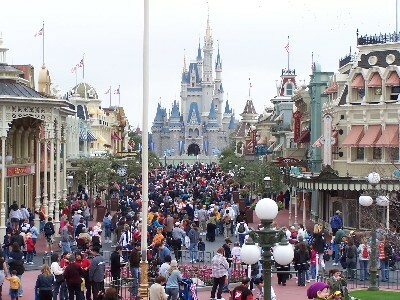 If you’ve never been to DisneyWorld, think about how you might feel walking from the top of California to the bottom in a crowd similar to the one pictured above. Walking throughout Disneyworld is similar to trekking across that state, including the part where you pass through Yosemite National Park. In my mind, there are only two choices: tennis shoes or ultra comfortable sandals when Space Mountain hiking. This ain’t no disco. Ain’t no country club neither. This is….Disneyworld. 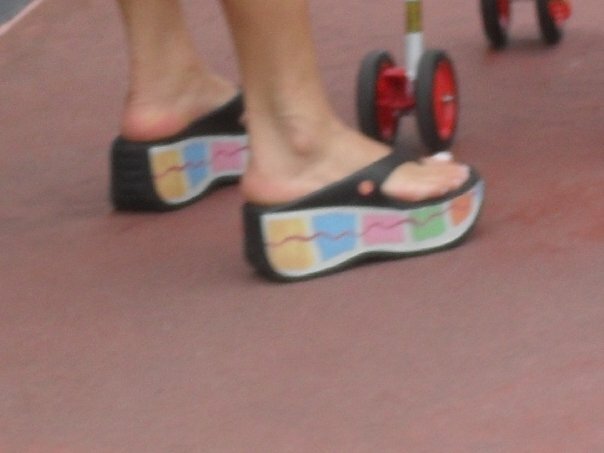 My little rule was broken many times by fellow Mickey lovers resulting in my sudden obsession to take pictures of ridiculous shoes worn at Disney. So, while you may spend your time at Disney trying to get that picture of Cinderella’s castle juuuuuuuuuuust right, I’m looking at your feet. Without further ado, let me hand out some awards, ‘mmmmkay? Hello, McFly. Those are too flat & too hard. I guess her feet have cushion, but…how can she walk on those up & down the Swiss Family Robinson Treehouse to the Haunted Mansion to the parade to the Mad Hatter Tea Cups to the Buzz Lightyear ride to… Lawduhmercy. I did not seek cover behind a bush or an unknown child’s stroller. I straight up whipped my camera out & took a picture of those boots like it was Mickey smiling at me. She was speaking Italian. I am so sorry this picture is so dark. Can you squint? THIS picture took some work, now. I had to snap a lot of pictures from quite a distance with my zoom. It was also getting late. This lady, y’all, was getting in the Winnie the Pooh’s “Hunny Pot” in those stankin’ thangs. She probably had been walking ALL DAY in them. She had several small children with her. She was also speaking Italian. The next time you go to a major amusement park, think carefully about your choice of shoes. Someone could be taking pictures of your feet. Mwuhahahahaha!! !